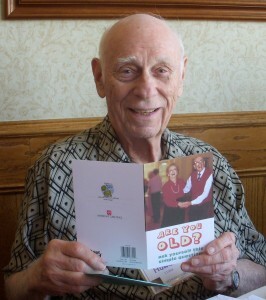 On July 28, 2011 my Dad turned 90! And he looks and feels great! So we talked about what to do to celebrate the occasion. Dad said, let’s forget it. I said, no way! First I planned a party for him at the Proud Bird Restaurant near LAX. Then I decided to interview Dad to get his life story on paper. We spent 5 hours over 2 days recording Dad’s stories of his life. I was going to make a little booklet, like Uncle Mel did about Dad’s Mom and his Dad. Dad has led a fascinating life and I think many of us (especially the second and third generations) would be interested to know about it. As I transcribed the five hours I got so excited because the stories were so good that I wanted to share them with everyone. So I decided to make a “movie” where Dad tells you about his life in his own voice and words! I put Dad and Lou to work scanning photos to go with the stories and I was off and running. Uncle Mel came to the rescue with some key photos and Josh’s best friends, Sarah and Evan Maas, became my associates on the movie making process. Somewhere between 60 and 100 hours later we had a movie ready to play for the party! I want to share our movie with you. You can do it at your computer! We split the movie into 3 chapters. The first chapter is from his childhood thru his WW2 Navy years (he spent part of WW2 mapping the Alaskan Oil Fields), marrying Mom, continuing in the Navy doing exciting things and then his horrific car accident. The second chapter talks about Dad’s work with celebrities for the Navy, his life with the Navy in Hawaii doing Cold War top secret work, his retirement from the Navy and his second career at KNBC-TV in Los Angeles managing public affairs programming. Continuing in this chapter you’ll see Dad and Mom’s travels all over the world and his next career with the Sepulveda Men’s Golf Club! This section concludes with a series of family photos through the years. The third chapter begins with a Sturm Boys tradition, The LineUp. You’ll meet the 4 Sturm Boys and the 3 Balloff’s through the years. The movie concludes with a tribute to Mom and Dad’s life together in photos. Each chapter is about 10 minutes. You can view them by clicking on the purple chapter title above!